Hello and Happy New Year! Do you know what is just as exciting as a New Year, it's a new Stampin' Up! Catalog or in this case Catalogs....because not only will the Occasions Catalog go live on January 3rd, but so will the Sale-a-bration catalog! Who doesn't love to get free stuff, right?? If you want to be inspired, you will want to check out this fabulous Sale-a-bration Kick Off Blog Hop! If you've already been hopping, I thank you so much for continuing! If you are starting here, please make sure to stop at every blog along the way! 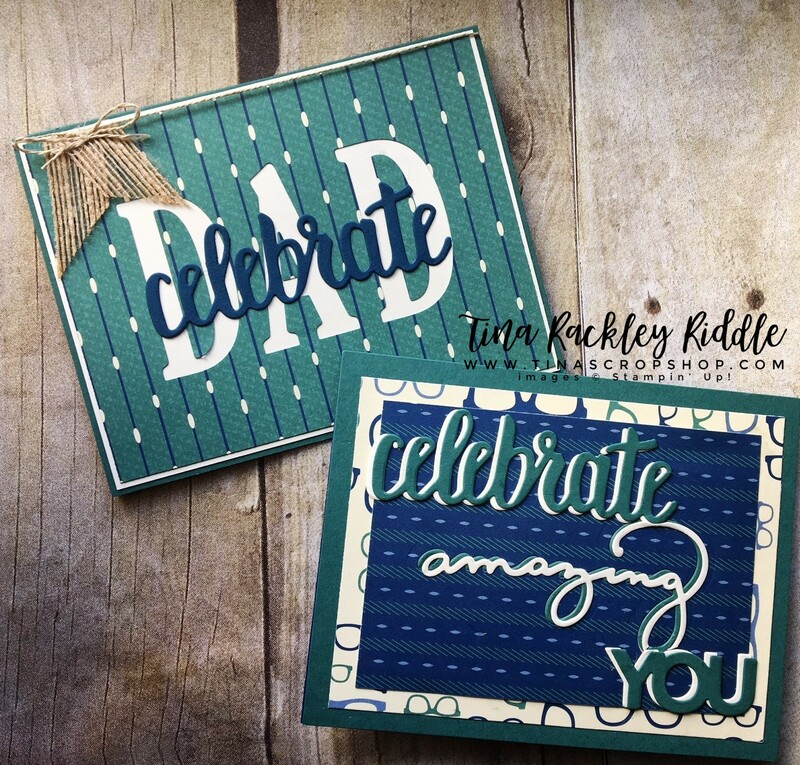 There are so many fabulous possibilities with this year's Occasions and Sale-a-bration catalog but I decided to feature the fabulous "Celebrate You" Thinlits dies! They are awesome and they are absolutely FREE with a $100 purchase from Stampin' Up! during Sale-a-bration! How fabulous is that?? I made two cards featuring them and both are masculine cards. I was really inspired by the awesome masculine "True Gentlemen" DSP in the Occasions Catalog! The colors are so beautiful and the designs are awesome! These cards were super easy yet pack a great punch with those gorgeous die-cut words! The Celebrate You thinlits are really amazing! For the Dad Card on the left side, I first cut out "DAD" from the True Genetlemen DSP with a Large Letters Framelits Dies. I backed it with a mat of Very Vanilla Cardstock and used the cut out letters as a template to glue the center of the letters back into it with a small amount of Tombow Multipurpose Glue. I then cut the "Celebrate" word out with the Celebrate You Thinlits Dies in Night of Navy Cardstock. I used a small amount of Tombow Multipurpose Glue dotted on the back of the word to adhere it. I added the matted panel onto a Tranquil Tide A2 Cardbase. I'm totally loving Tranquil Tide now.. it is such an amazing color! I used a bit of tear tape to adhere two small angled strips of 5/8" Burlap Ribbon to the top left of the card to make a small banner. Linen Thread was then ran around the top of my card and tied it into a bow ending right at the top of the little Burlap Banner. I used a small drop of more of the liquid adhesive behind the bow and put a small block on it until it was set. For the second card I used another Tranquil Tide A2 card base and used two different panels of the True Gentlemen DSP to the front. I cut out all three of the words from the "Celebrate You" Thinlits Dies in both Very Vanilla Cardstock as well as Tranquil Tide Cardstock. I offset the layers on all three words to add a bit of interest to them. So simple but really a nice masculine card. Thank you so very much for stopping by! Please make sure to check out all of the other inspiration on the hop! So many lovely creations and ideas await you!